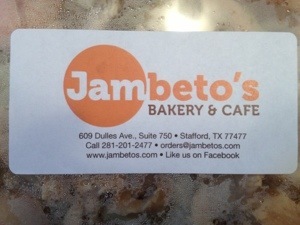 Yesterday I tried a new Filipino restaurant on Dulles called Jambeto’s Cafe and Bakery. Every now and then my mom used to bring home pancit (Filipino noodles) from work parties, so I knew that’s I wanted to order. 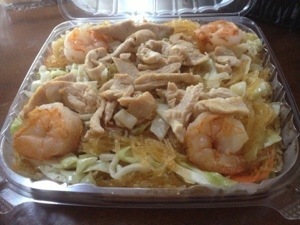 The to-go box of shrimp and chicken noodles lasted me lunch, dinner and an extra lunch. 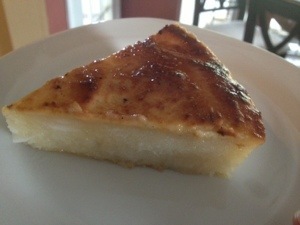 I also brought home cassava cake, which is made out of the potato-like yuca/tapioca. There’s a Kerala dish called kappa made out of this, which people loooove but I could never get myself to enjoy. So I was skeptical about this cake. But I took a chance and was pleasantly surprised. It was sweet and dense and airy at the same time, even with the savory yuca. I was also taken in by the store’s signs, labels and graphics, which are eye candy. The owner said her daughter put it all together. I love a well lit and well labeled food display area. Check it out. This entry was posted in Brilliant Ideas, Get Your Eat On. Bookmark the permalink.